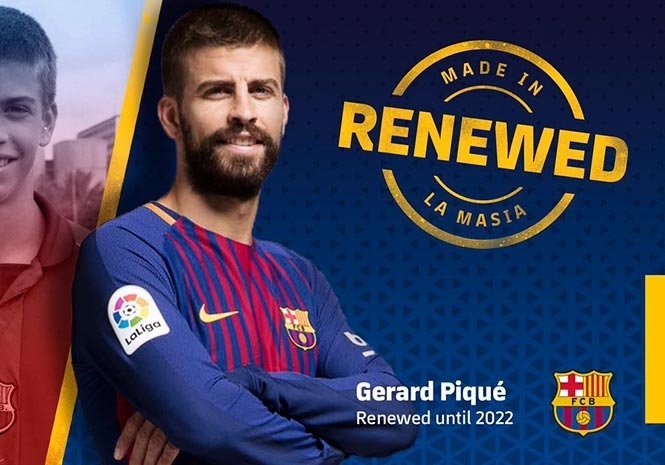 BARCELONA defender Gerard Pique has signed a contract extension with the club until 2022. The 30-year-old’s contract, which sees him tied to the Catalan club until 30th June 2022, has a massive €500m buyout clause. The current La Liga leaders posted a video celebrating the Spaniard’s achievements with the side after the news was confirmed. Pique joined Barcelona’s coveted La Masia academy as a 10-year-old in 1997, but left for the Premier League in 2004 when he joined Manchester United. He enjoyed 4 successful seasons at Old Trafford and was part of the double winning side that won the Premier League and beat Chelsea in Munich in the 2008 Champions League final. The central defender was bought back to the Camp Nou by Pep Guardiola in the summer of 2008 and has since won a staggering 25 trophies during his time with the Catalan Giants, including 3 Champions Leagues, 6 La Liga titles, 5 Copa del Reys, 5 Spanish Supercopas, 3 European SuperCups and 3 Club World Cups. The Spaniard is one of just seven players to win four Champions League titles alongside club mates, Andres Iniesta and Lionel Messi, former team-mates Samuel Eto’o, Xavi and Cristiano Ronaldo, who both won the title with Manchester United in 2008, and Clarence Seedorf.